Seriously? 3 posts in one week after such a long hiatus? I don’t mean to shock you into next year. I have a huge backlog of “stuff” that I haven’t had time to blog about. What’s this post about? Oh, yes. Rookie Mistakes. After all these years, I still make them. My only excuse for this one is that I have been so wrung out on the work project that I only do things that require zero brain cells when I’m home and not working. When you couple that with using the miniSpinner for the first time in well over a year, you end up with really stupid mistakes. What kind of mistakes? The one where you forget to check which direction the miniSpinner is set to spin before you start plying 12 oz of yarn. Even worse, I was so disappointed with the plied yarn because it looked so flat and lifeless that I abandoned it there on the spool rack while I pouted. It took me a FULL month to figure out what was wrong. Why so long? It wasn’t until I started to skein it up for Wash Day that I saw why the yarn didn’t look/feel right. It was then that I realized that I had plied it in the wrong direction. Duh! The singles are Z spun. In the picture on the right, the right yarn was plied Z instead of S (left yarn). Look how much it fluffed up after I ran it back through the miniSpinner, in the correct direction this time. This is before it had a chance to relax in a hot bath. The picture is of the same length of yarn. What you don’t see is my fingers pinching the yarn just off the bottom of the picture. The top right is as it comes off of the old bobbin, leading to the pinch point. The left yarn is as it heads back into the miniSpinner (top left) after plying it in the opposite direction. The finished yarn (2nd and 3rd skein from the top of the picture to the left) has a much livelier appearance and softer hand. What will this yarn become when it grows up? It will be another fitted vest for layering under winter exercise jackets. I plan to knit narrow stripes with the 2 colors. We will see. The air is crisp now during my morning and evening bicycle commute. I will need something soon. As for the remaining skeins in this picture, the second from the bottom has already been knitted into the BSJ. That takes care of 3 out of the 5. 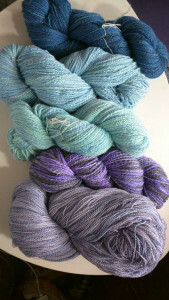 The pygora blend (top in blue) will be a scarf/shawl. The lavender 3-ply (bottom) will be a sweater/vest of some sort. I haven’t decided what yet. With 1,400 yards, I should be able to do something with it. The finished yarns look so yummy. I love the colors.